In the face of all provocation, silence is the best weapon. Silence is not a sign of weakness. It is a sign of an astute evolution, absolute mastery and a scientific temperament. But most of us think just the opposite is true. We want to react to every provocation, respond to each impulse and make more noises__that are seen and heard__than take concrete action on situations that matter greatly to us. Speech, rhetoric and a visible expression of intent seem to be more palatable, more in demand, than a silent resolve and resolute action. Yet it is those who make no noises that work the hardest and deliver the most. Look around you. In your family, at work, in society. All that is being accomplished is by those that put their heads down than those that shoot off their mouths. Amongst other species too, the ants are the ones that get the most done, making no noise whatsoever. Over the years, I too have transformed from being ‘visible, expressive and overtly charged’ in any situation to now being a ‘silent yet focused soldier’. I rue a conversation__no, it was a monologue, with me alone speaking!__that I once had with my dad years ago, as much as I remain inspired by it. I was angry with my dad for being a ‘silent spectator’ to the goings-on in the family and called him over to ‘speak my mind’. I spoke animatedly, taunting him, accusing him of inaction and ineptitude. I even recall my own words vividly: “Dad, you are making us all victims because of your godforsaken silence”. My dad, predictably, remained silent and refused to respond to my charges or provocations! Today, somewhere in the third quarter of my Life, I hold that meeting with my dad as a beacon, a shining light, of living intelligently. Over the same years, since that monologue, I have seen my dad handle many a Life storm, and he is still handling one at the moment, with silence as his Brahmastra (the sacred mythological all-powerful weapon that can wipe out all evil). I have learnt from his silence. Silence, therefore, is not a sign of giving in or giving up. It is action in its purest, all-pervasive form. Silence is our native state. The entire Universe is cloaked in silence. And this is from where all energy manifests. 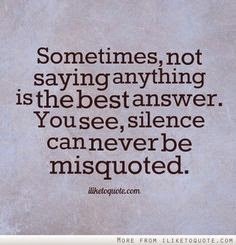 So, by choosing to be silent in any situation__in public debates, in mud-slinging campaigns, in the face of allegations and accusations, amidst rabid, verbose, flaky points of view__you are demonstrating enormous will and are conserving precious energy to deploy into action than dissipate it in unnecessary word-fare. Here’s what Greek philosopher Xenocrates (396~314 BC) confessed to: “I have often regretted my speech, never my silence.” When you are silent, you connect with your deeper Self, your real Self. That’s where all the energy that created you lies. When you tap into that energy and harness it, all the actions you pursue will yield results and ensure the outcomes you want. The best way to win any battle is not to fight at all. The best way to win an argument is to not speak at all__but to always and only act on what you believe in.